Looking for ways to cut the cost of pet food and other pet care products? Here are 10 steps that will save you money and still keep your pets healthy and happy. Note: Scroll to the bottom of the page for the list of current printable pet coupons. Pet stores and grocery stores often offer customer loyalty programs which include pet clubs. Shoppers can expect to earn rebate checks for dollars off their future purchases by providing-proof-of-purchase (store receipts and UPC codes) and completing rebate forms. Some stores make it easy by tracking your pet food purchases and automatically providing you with the savings once you meet the specific rebate criteria. Ask your grocer about what other programs your store's pet club offers, such as free or drastically reduced prices on in-store pet health fairs and clinics. There are several pet food manufacturers competing for pet owner's dollars. Because of the competitive nature of the industry companies often offer shoppers free pet food, pet-related coupons, and pet toys. All it takes is registering to become a member. Another advantage to becoming a member is that some of the companies offer rebate checks when you buy a preset amount of dog or cat food. Also, like so many other loyalty memberships, periodically the companies will send out members-only newsletters with pet care tips, exclusive coupon offers, free samples, contests, and other money-saving perks. Finding coupons for dog food, cat litter, and other pet-related products is fairly simple, but finding coupons for the kind of pet food that you want to give to your pet may be more difficult. For this problem, we suggest that you go directly to the manufacturer that makes the brand that you buy and ask for a coupon. You can generally do this through email. Here are examples of emails sent in for coupons that have been successful. 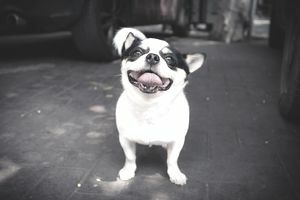 There are several free online resources for printable coupons including those for pet food and other pet care products. You can also visit the websites of the grocery stores in your area for additional coupons. The Printable Pet Coupons page has a running list of printable pet coupon offers. Many times the coupons can be stacked with store coupons for even more savings. Coupons can often be found on the inside and outside of pet food packaging, on labels of canned dog food, or product "points" which are removed from pet food bags. The points often qualify for free bags of food once the amount needed it reached. Take time to browse the Sunday newspaper for pet-related coupons, then look for local sales on the same products. Stores like Dollar General, CVS Drugstores, Walgreens, and Rite Aid carry popular pet products sometimes at prices that are lower than you will find in the grocery and pet stores. You can also find at least one or two store coupons a week from these stores. Catalina coupons are the coupons that print out in a machine after you finish checking out at the grocery store. Many times when you buy dog or cat food a Catalina coupon will print with a coupon for competing manufacturers. For example, if you buy a bag of Purina Beneful dog food you could a Catalina coupon for a bag of Kibbles & Bits. There are many resources for coupons on eBay for dog food and cat food. Many couponers use eBay to find coupons, but if you are not familiar with how it all works Aron Hsiao, the Guide for eBay has a great article with tips on what you need to know before shopping on eBay. Veterinarians often have free samples of pet food and treats, along with money-saving coupons for pet products. Also, ask them to recommend the best and most economical pet food for your animal. You could be spending unnecessary money on the more expensive brands when there is a cheaper brand that is equally as healthy for your pet. There are many grocery shopping applications that help shoppers quickly compare prices at all the local grocery stores on single items. The same apps display any current coupons that are available. Using grocery store apps when you shop for pet products will have the same benefit as any other products you buy in the store. A grocery shopping app that we like to use is Grocery Gadgets which can be used with iPhone and Android mobile platforms. The cost is just $4.99 which you will likely get back in savings on your first trip to the store.